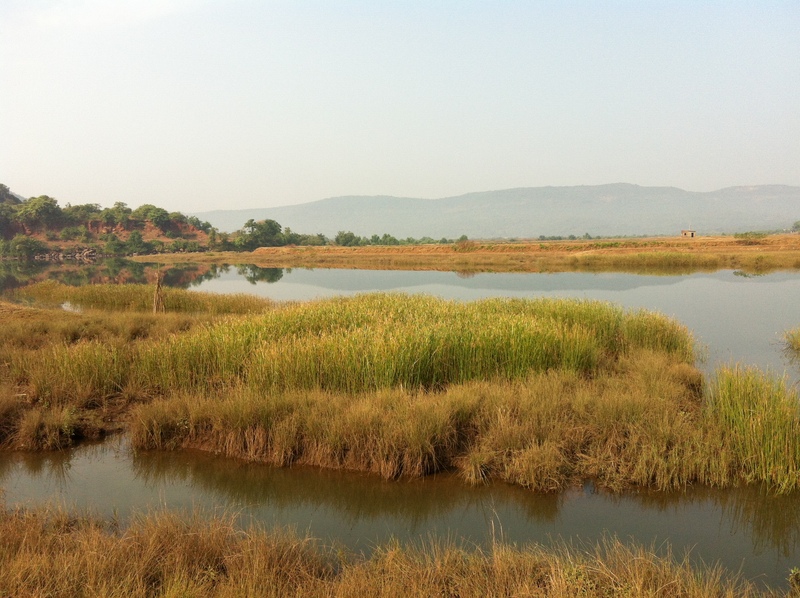 This weekend, I enjoyed my final vacation-within-the-vacation over a mini family reunion organized by cousin S at cousin G’s farmhouse in Malathe, a small village close to the village of Tala in Maharashtra. The land is no longer used for prawn farming like it was when I last visited it in 1997 and is now more of a getaway home. There are caretakers in the neighboring home who raise chickens and come in and help cook meals when there are guests. Sister-in-law M also lends her culinary craft to the kitchen, and nephew O is close friends with the caretakers’ children, so he is always excited to come down and hang out at the house. 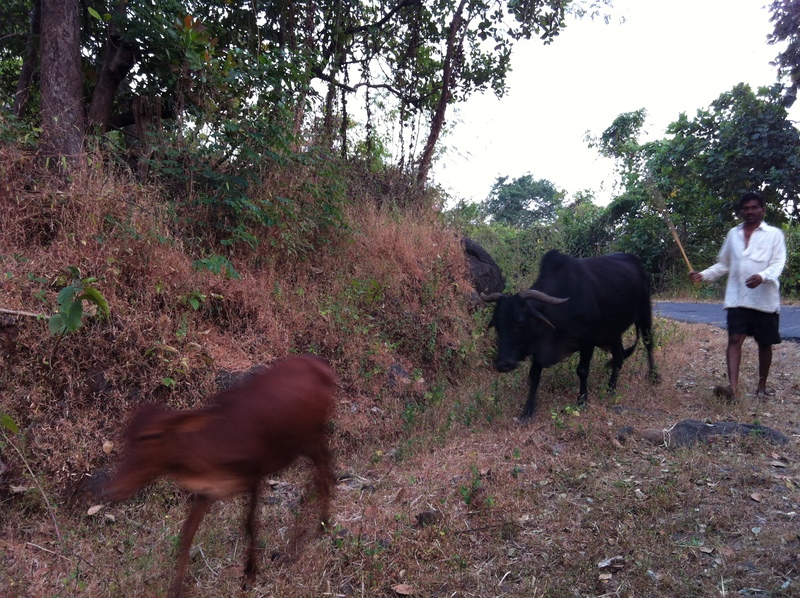 I got a ride to the house with A, A, and V. The drive took around four hours from Bombay, and it was interesting experiencing a sudden transition from loudly honking cars packed across the highway to a much lower volume of traffic, goats, and cows on windy two-lane roads. 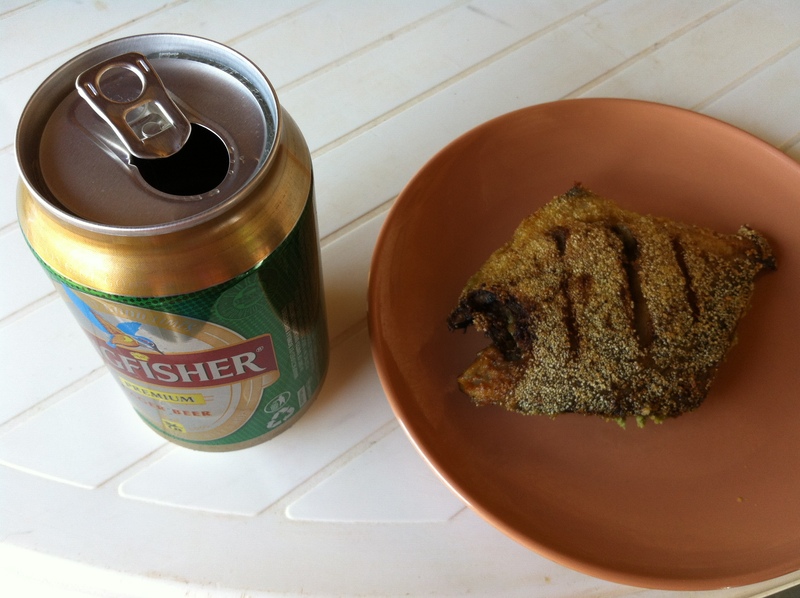 We stopped by a liquor store to get some cool beer along the way, and we were welcomed with a chutney-filled pomfret once we arrived at the house, which paired absolutely perfectly with the Kingfisher! To make the picture even more perfect, we then spotted some pretty kingfisher birds, among many other types! My sister missed out on birdwatching, her favorite sport! We went for a drive in the evening which was really cool and pleasant, albeit quite bumpy and windy. I started getting a headache and having delirious thoughts and wondered if I was going to have a life-altering revelation. It turns out I just had to puke. I’m not sure if I drank some bad water or got motion sickness or just ate too much or some combination of them all, but I felt much better and less likely to have a revelation after I puked (I’m not the type who desires a sudden life-altering revelation; I prefer for wisdom to enter me more insidiously). After popping some Tylenol and taking a brief nap, I was ready to spring back up with a vodka cocktail and chicken curry and about five billion fried vadas. Yum!!! It was so fun to have this rural night out with family members of my generation, hanging out on the deck and eating and laughing and looking at old photos and listening to chirping crickets. It would have been even better if all of the cousins could have made it, but there are many more trips to come! This morning after chowing down on some idlis and dosas, we walked around the farm and learned more about the uses and history of the land. We then ate another delectable meal featuring prawn curry and then headed back into Bombay, rounding off the evening with a delicious meal at H Mavshi’s place. Somehow I have come down to the last four days of my trip! There are a few relatives I still need to try and catch up with, and I’ll finish shopping and rounding up the items that my parents have requested. Oh yes, and I will also check out Gold’s Gym!